Bob Rowntree, left, beat Ben Rowark in Manchester. 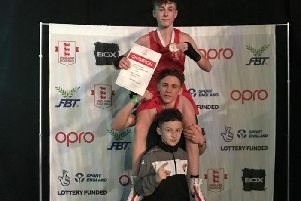 A Coastal ABC boxer picked up a impressive win in Manchester on Friday night. Bob Rowntree got the better of home favourite Ben Rowark in front on a big crowd. The West End Road gym’s fighter was on top from the off, outmanoeuvring the man in the opposite corner in the opening round before stepping on the gas. Rowntree totally dominated the second, forcing a standing count, before doing the same again in the final round to take victory. The Coastal man, 21-13-8, inflicted just a fourth defeat in 16 contests on Rowark. Rowntree is pencilled in for the ABA Championships at the end of April and the Hull Box Cup in May. First up he fights on Coastal’s own show at Lancaster & Morecambe College on Saturday, March 3. For tickets, priced £15, call Frank Harrington on 07789 261768.